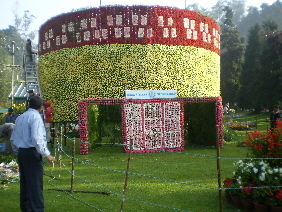 The 114th Flower Show at Ooty’s Botanical Gardens from 14th to 17th May 2010, was a wonderful reminder of the kind of beauty God gives humankind from His vast storehouse of treasures. The colour of the flower beds, the lush green lawns, the tall conifer trees and the soft winds whispering in the treetops, made one wonder if this was a piece of heaven. Spread out over 22 hectares of land, at a height of 2400 metres above sea level, this garden with its terraced layout was a perfect setting for the Flower Show. The artistic display of a variety of flowers from roses to dahlias, lilies and chrysanthemums to asters and pansies, was a feast for the eyes. The bonsai section with its rows of midget trees, made a nice display. A few stalls also exhibited different fruits and vegetables. The highlights of the show were three outstanding pieces. One was the exact replica of the Secretariat Building, made of chrysanthemums. Alongside was the statue of Thiruvallar also made with flowers. The second was a chicken of gigantic proportions made of white flowers, and the third was a vase fashioned from red chrysanthemums, with a base of white roses. concrete base, which was a permanent exhibit. Further up was the Italian Garden surrounding an octagonal bandstand. This was first laid out by Italian prisoners of World War I, who were shifted to Ooty. It is the most attractive part of the Botanical Gardens. Stalls selling a variety of fruit jams, pickles, honey and eucalyptus oil were kept busy by a never ending line of customers. The Todas had their own model hut on display, though none of them were dressed in their original costumes or had their hair in ringlets. There were shawls, table runners, bags and table mats with specific designs in red against a cream background. However, they were too expensive to buy. The Conservatory and glass houses were closed to the public. On all three days of the show, the garden was teeming with people from 8 a.m. to 6.30 p.m. There were 30,000 to 35,000 people everyday. Some came with genuine interest in the flower show. But most came there for a picnic with family and friends. In spite of the garbage bins planted at various sites, the lawns were littered with all kinds of rubbish. The sweepers of the garden had the unending job of clearing the litter. When will our people cultivate discipline and a civic sense! But in spite of this, the Flower Show was an unforgettable experience. Here it seemed that Nature was touched by a magic wand. Flowers are attracted by all. Especially i like ooty flower shows. Beautiful...Wish that there were more pictures though. They're the attractions for travelogues. I've been to Ooty many times. Yes I do stay in JVV. flowers always attract me. Eva do u stay in JVV Bangalore?